OMG, this is a BFD! I, along with everyone else who keeps their eyes on these things, shouted a big hoot of delight this morning when I saw Philae Lander put on a real showstopper of a landing on a duck-shaped comet named 67P/Churyumov-Gerasimenko just after 11:00 am, EST in the USA. Released from Rosetta, it marked a real victory for a huge gamble that will reap large rewards for anyone who’s interested in the miracles of our solar system. I’m sorry, but I’m at a loss for words to describe what an amazing accomplishment this for the ESA, for science, and for our futures, so excuse the sap. The New York Times posted a series of tweets that a very excited Philae, who couldn’t wait to touch down on the surface of 7P/C-G after journeying ten years to get there (do you blame it?). The newspaper also has a series of incredible photos that document the comet as detail its landing place. What makes this such a special event? Landing on a relatively small target from a great distance notwithstanding, it’s ESA’s and the world’s first opportunity to scientifically examine, up close, just exactly how a comet operates, what it sees, where it goes and what it does for a living. The pictures indicate that its shape isn’t anything to brag about, but again, it’s the first time anyone has ever set foot on such a heavenly object and it’s a premiere learning experience for all. NASA has also contributed three instruments to the lander mission, so what makes this even better its international, offworld educational opportunity. 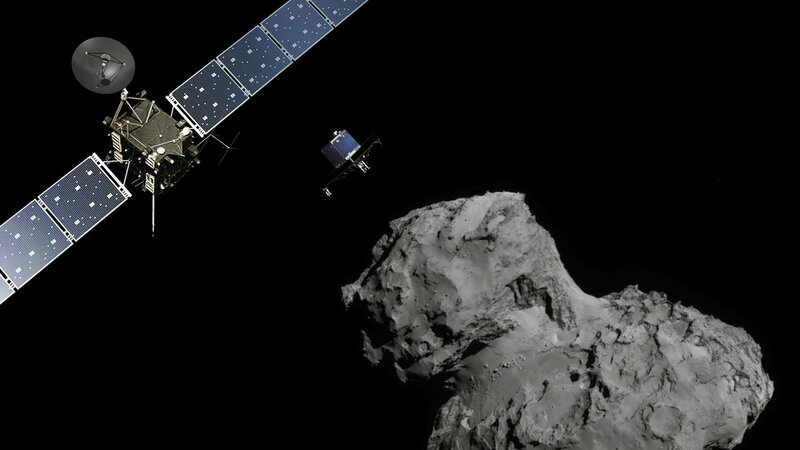 Philae’s got a big job ahead of it. With only 64 battery hours to get through its tasks initially, it will depend upon solar batteries to provide it with power until March. That, and it has an awful lot of tweets to send us to let us know how it’s doing! For a laugh, check out xkcd’s comic on the event.